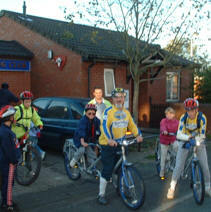 Rochdale Special Needs Cycling Club caters for mentally disabled children and children with learning difficulties, and takes groups of children for cycle rides every weekend. With much needed grants from the BWCF during 2007 through 2009, they were able to purchase 4 'wheelchair tandems' that enable children with mental disabilities to ride with an adult, which otherwise would have caused them to be a danger on a tandem or similar vehicle. The wheelchair bikes, with their special harness, have opened the door to cycling to these children. It is estimated that the BWCF has enabled between 80 and 100 children to participate in these rides, thus increasing their quality of life. In fact, some of these children have improved solely because of this to such an extent that they can now be trusted in one of the group rides on a normal bicycle.